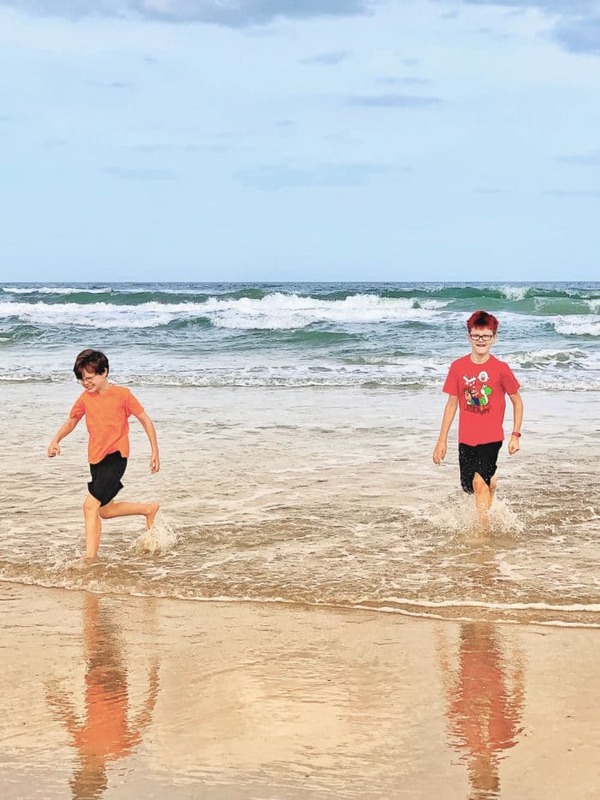 If you’re planning a family vacation to the Florida coast, check out these fun things to do in St. Augustine with kids. We had a great time and can’t wait to visit again! Recently, my family hopped in the van and drove south for a few hours in search of warmer air and lots of sunshine. Living in Raleigh, NC, we are fortunate to have a lot of drive-able options, which really cuts down on travel expenses. So this year, we decided the roughly 7-hour trip to St. Augustine, FL would be the perfect spring break vacation. Despite being born and raised in Florida, I’ve never been to St. Augustine so I was excited to find some fun things to do as a family. That being said, I feel like we barely scratched the surface! We could have stayed another week in this beautiful coastal town. We were provided with free admission to some of the below attractions courtesy of the St. Augustine Convention and Visitors Bureau. All opinions are my own. We love our long family weekend trips and I always enjoy finding attractions the whole family can enjoy. 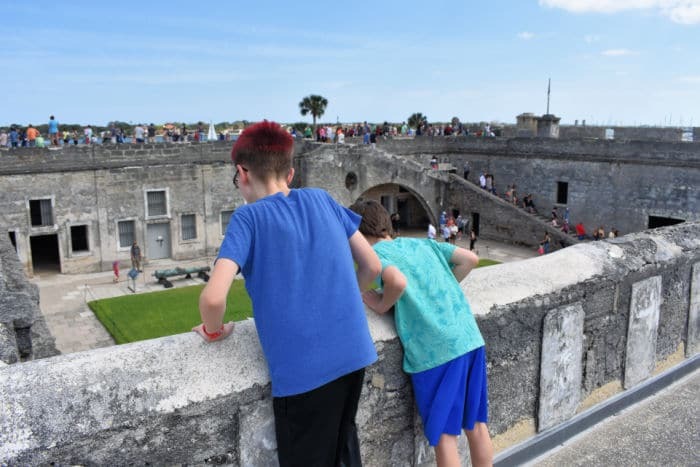 Here are a few things to do in St. Augustine with kids, but by no means is this a complete list. 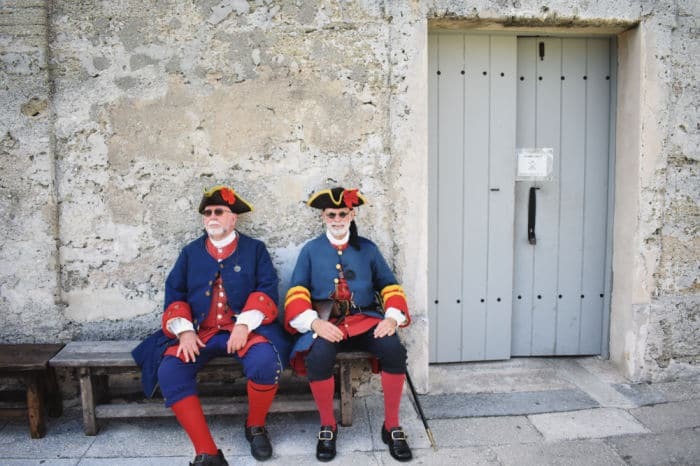 When you visit “the oldest continuously occupied settlement of European origin in the United States“, it’s going to take more than a long weekend to experience everything. I guess that means we’ll have to go back because 454 years is a pretty long time y’all. Here are a few ideas to get you started. 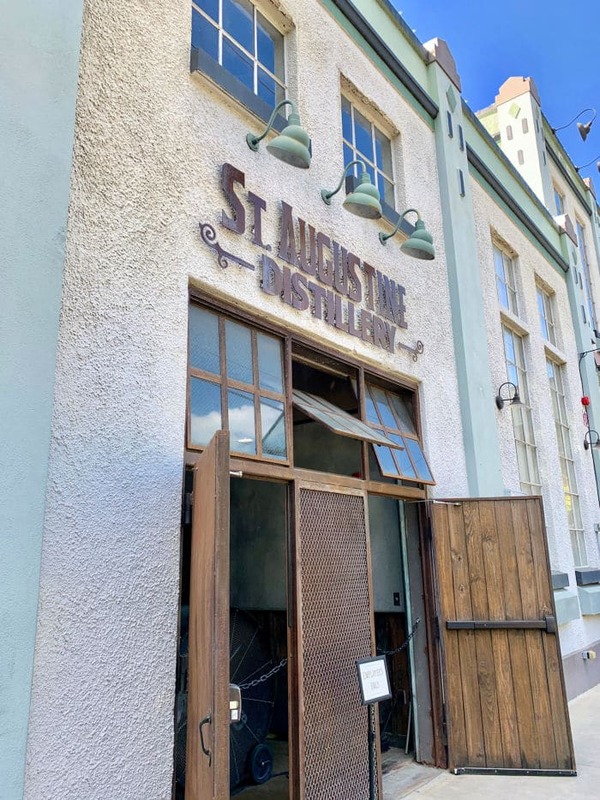 Have you been to St. Augustine yet? Let me know your favorites so I can add them to my list for next time! 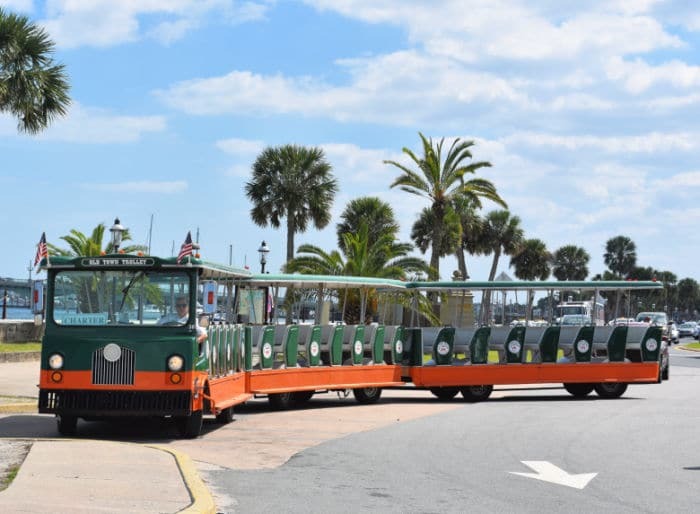 One of the best ways to get around town is with a hop-on/hop-off trolley tour. You could spend some time simply riding around the loop to hear interesting facts about the city’s history or exit the trolley at one of over 20 stops to explore. We enjoyed Old Town Trolley tours and found each of our drivers to be full of interesting information, pleasant and safe. We also love that the trolley had a designated stop at our hotel so all we had to do was walk out the front door to get started! Passes for this trolley are currently $24.99 for Adults and $10 for kids over 6. Children under age 6 are free. This National Monument was probably first on our list of vacation to-dos because of its rich history and interesting construction (the walls are made of broken shells!) along with a pretty view and historic reenactments. This was our 10-year-old’s favorite! If you can get there when they fire off the cannon, it’s really cool to see and hear. Those things are loud! Don’t worry though, they will tell you exactly when you need to cover your ears. Like the trolley tour, we found everyone at Castillo de San Marcos to be knowledgeable and very kind. This stop is also on the trolley route so if you want to enjoy a tour, just exit the trolley and off you go. Adults are considered age 15+ and the cost is $15 per person. Anyone under age 15 is free. The fort is also within walking distance of tons of restaurants and other attractions so you may want to plan to spend some time in this area. I would allow for about an hour at the fort depending on the ages of your kids. We went in every room but didn’t read everything possible. We could have stayed longer. The St. Augustine Lighthouse and Maritime Museum is located on Anastasia Island, which is a quick drive over the bridge from the mainland. We stayed on this island to be near the beach so we hopped off the trolley for an hour to explore on our way into town. The trolley returns to this stop once an hour (as opposed to every 15 minutes in town) so we wanted to be sure we didn’t miss it. That said, we could have spent more time at the lighthouse because it was so cool! They can only let a certain number of people inside at once so there was a line to get in. If your kids have trouble waiting, I recommend getting there early in the day before it gets too hot and having a few snacks for the wait. I’d say we waited about 20 minutes to go up, but there was another guide outside telling us fun facts and interacting with whoever wanted to know more. When it’s time to go in, get ready to climb! 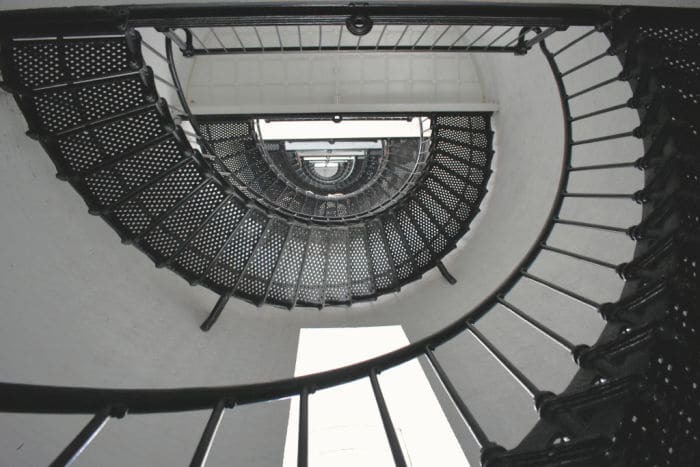 You’ll climb a dizzying circular staircase for a total of 219 steps to the top and the view is an amazing reward! We spent a few minutes taking photos and enjoying the view before heading back down. Even though it was crowded, we didn’t feel rushed at all and the kids loved it. 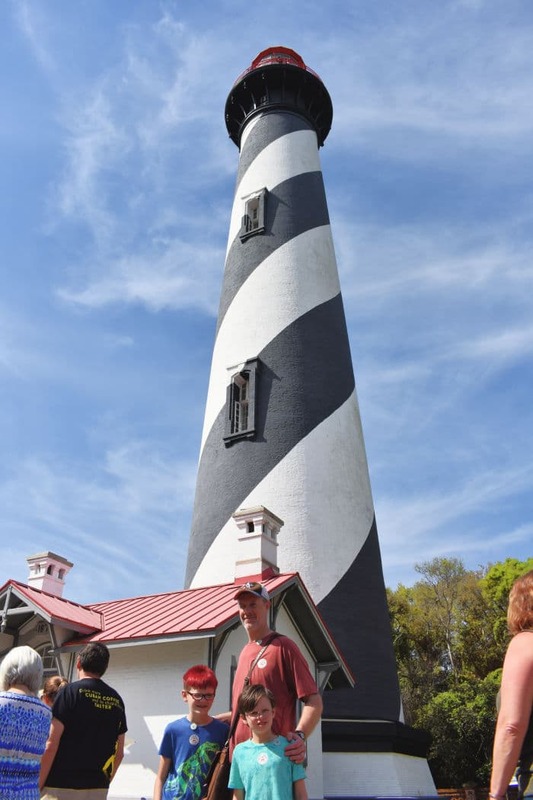 If you just want to do the lighthouse, an hour should be plenty of time but if you want to see the rest of the museum, or enjoy a snack there, I would allow for at least 2 hours. 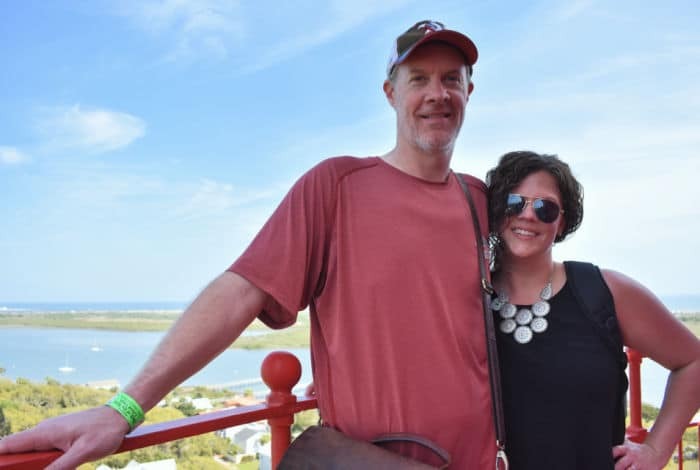 Ticket prices for the St. Augustine Lighthouse vary based on time of day and date. I grew up only knowing the pristine white sand of Clearwater Beach, FL so whenever I go to a beach, I judge it by the sand. Now that I live in North Carolina, my feet cry each time I have to tromp through tiny shells to get to the good stuff. I just figured that was a byproduct of being an Atlantic Ocean beach. I am happy to report that St. Augustine beach has beautifully soft sand that is as close to home as I’ve seen. I made sure we stayed in a hotel that was right on the beach for quick access and while it was a little too chilly to swim, we took several walks and I even got to enjoy the sunrise. I don’t know about you, but the beach is so healing for me. Even if I don’t spend all day in the sand, being able to take a morning walk and listen to the waves is my idea of perfection. One of the more appealing trolley tour stops (for the grown-ups) was a tour of the St. Augustine Distillery. This is a free 30-minute tour and you will get to sip a few cocktails as you learn about the immensely cool history of not only the company, but the building itself. And yes, it’s totally kid-friendly! Kiddos on the tour were given samples of lemonade and there were a few seats in the tasting room to relax. If you want to make a meal of it, there’s also a restaurant upstairs that is definitely worth a visit. We didn’t have time to eat when we were there but we did have time to grab a drink. They even made cola from scratch for the boys and we all thought that was super cool! Not to mention, the spirits were quite tasty. We ended up with a bottle each of gin and bourbon to bring home as a souvenir. 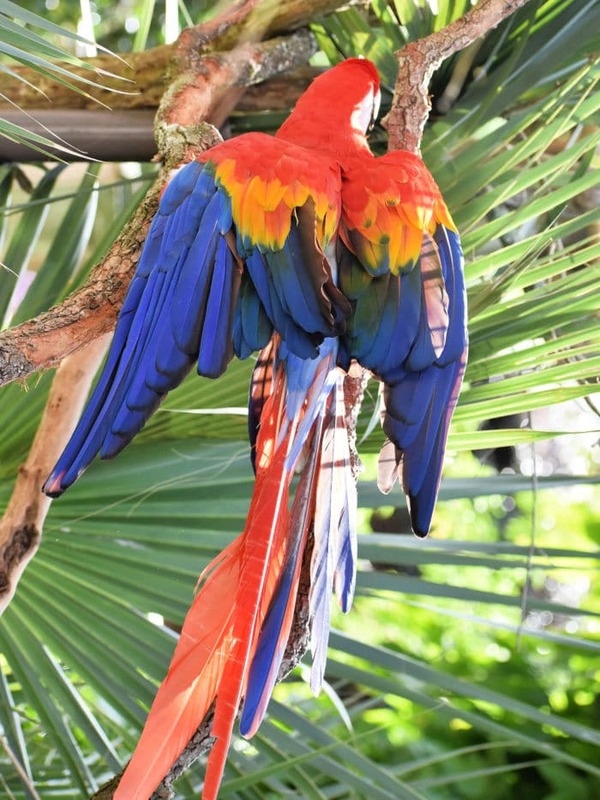 When we were planning this trip, another attraction high on the list was spending time at the St. Augustine Alligator Farm and Zoological Park. 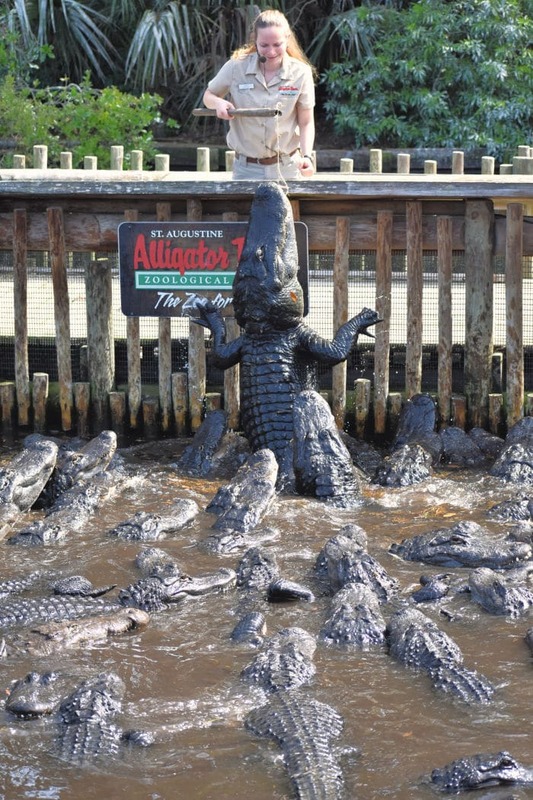 Really, I just wanted the boys to see some real Florida alligators. I had no idea we would be in for such an education! You can easily spend 2 hours here and maybe more depending on what you want to do. There is a restaurant so feel free to stay for lunch. They also have a zipline course that goes over the whole park if you’re feeling adventurous. I have so much to say about this place because we loved every minute we were there. I’m going to write another post in detail, but it’s safe to say the farm exceeded our expectations. We saw alligators, crocodiles, snakes, amazing birds and even turtles and lemurs! It was a blast. Make sure you don’t miss feeding time for the gators. It’s a must-see! The gators aren’t the only ones who get hungry! 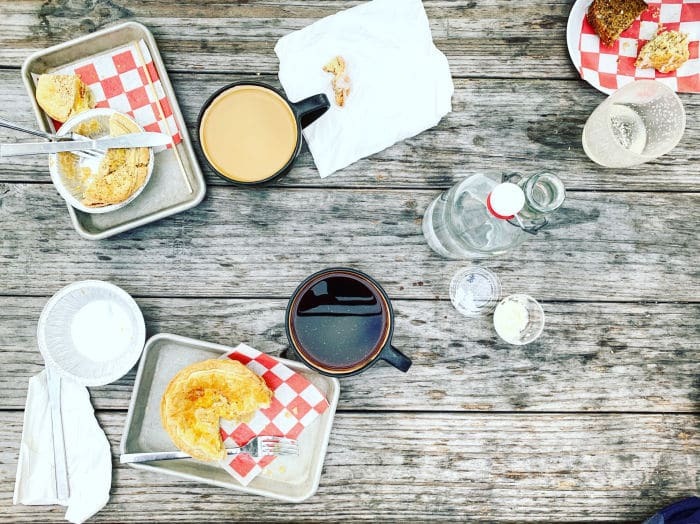 From ice cream shops to amazing seafood and historic landmark restaurants, the food scene in St. Augustine is not to be missed. We had some delicious meals during our stay and I honestly wish we could have eaten more! There were so many options. 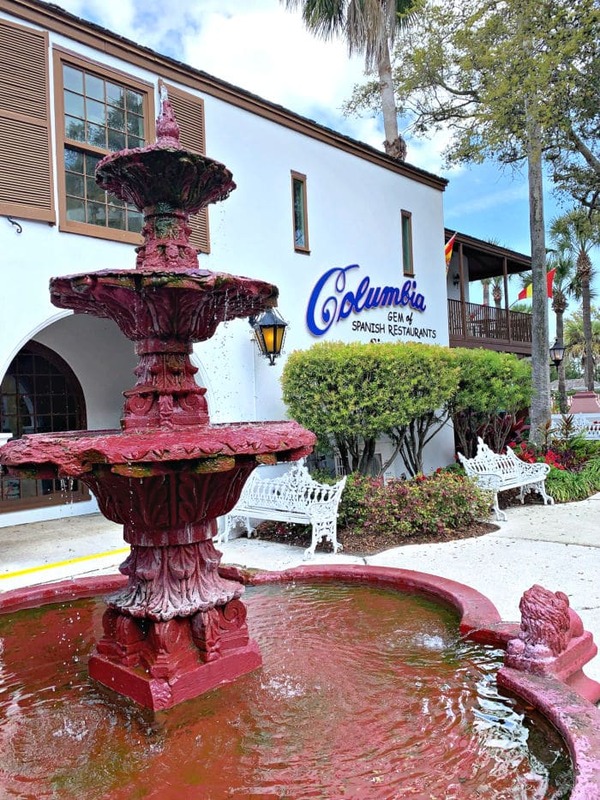 Two of our favorite sit-down restaurants were the Columbia Restaurant right in Historic St. Augustine and Sunset Grille on the beach side of the bridge. I also loved the Kookaburra Coffee shop, which was beach walking distance from our hotel. The kids weren’t thrilled with the options here but the grown ups loved it. Ha! You can take a look at the menu before you go as your mileage may vary. The coffee was delicious! It’s safe to say that St. Augustine has won our hearts and I hope we get to return because there is so much left to see and explore. It’s a manageable drive from Raleigh and we will enjoy our vacation memories for years to come! If you have any questions about planning your own St. Augustine, FL vacation, let me know! I’m happy to help. You did so much! Great advice. Thank you! I would do it all again too. It was so fun and the residents were all just so happy to be there! I guess I can see why. Thank you for all these great ideas! My husband and I took a trip in that direction last September for his birthday and traveled along A1A. We enjoyed the journey so much along the coast we got to St. Augustine around 7 and a lot of things were closed for the day. We are going back again this September and taking the straight route so we can do everything.